Back in February, Days of Wonder – the makers of Ticket to Ride – announced a Map Design Contest. Per the contest information, the winning fan-created map would join other maps and be released as part of a new product, the Ticket to Ride Map Collection, slated for October 2011 availability. The company received 612 entries from 40 countries… but has been pretty tight-lipped about the winning map or what might be contained in the "Map Collection." Fans have been hoping for the unpublished "Japan" map that creator Alan R. Moon previously noted was the inspiration for the Alvin & Dexter expansion. Leaked information from a game event website seemed to indicate that this "Map Collection" concept was actually part of a series, with many releases planned. Introducing the Ticket to Ride Map Collection, a new series of Ticket to Ride expansions featuring 2 different Ticket to Ride maps on a single double-side board. 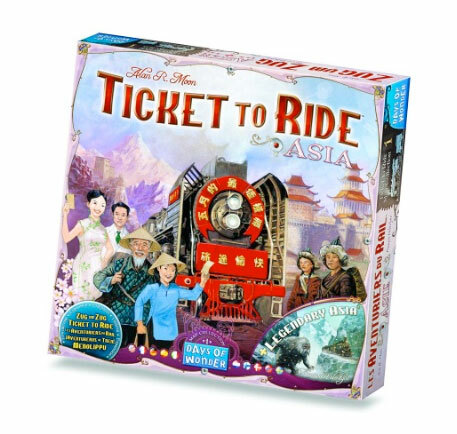 With Ticket to Ride Asia, you'll embark on an incredible adventure in Alan R. Moon's Team Asia map. Specifically designed for up to 6 players, you and a partner will team up against other groups on a 25,000 km wild ride from Kabul to Beijing, through the steppes of Mongolia and the Gobi desert up to the Yellow River! Or, if you prefer the quiet pleasures of traveling alone along the Silk Road, or winding your way through the hustle and bustle of Indochina, venture into Legendary Asia. The first thing we notice from the phrasing and box art is that it looks like we're getting just 2 new maps. Based on the contest text from February, I thought there would be quite a bit more. For example, the original contest description noted that the winner's design would be "included in the Ticket to Ride Map Collection to be introduced at Essen Spiel 2011, alongside brand new maps designed by Alan R. Moon himself." The word "maps" is plural regarding Mr. Moon's contribution, thus you'd assume there would be a couple from him along with the winning fan map. However, based on the artwork and description, it looks like we are just getting an "Asia" map and a "Legendary Asia" map. Another interesting element to note is the box art includes the number 1 (look at the side as well as right above the Days of Wonder logo on the front). This would seem to support the earlier hunch that this "Map Collection" idea is more of a series rather than a single-release product. As far as the "double-sided board," this has never been done for a Ticket to Ride map before, however Days of Wonder has a lot of experience doing it, as they currently use this production technique for their Memoir 44 World War II map expansions, as well as for their Small World civilization game. An interesting twist from the description is the idea of accommodating up to 6 players using a team-based approach. Currently, a Ticket to Ride game can handle only 5 players (without creative modification). Without the addition of new trains or components, it's been suggested in the BoardGameGeek forums that this would only require 3 sets of trains, with each partner team controlling one set. We'll have to see if this speculation is correct when the game comes out. In the end, in looks like Ticket to Ride Map Collection #1: Asia is modeled after the Switzerland expansion in regards to packaging and pricepoint. The artwork shows a pretty thin box, which would indicate just the inclusion of maps and new Destination Tickets, just like Switzerland. The player would need to provide trains and Train Cards from other version of Ticket to Ride. The suggested price of $30 also is quite a bit lower than a full Ticket to Ride game. Let's hope the production quality is better than Switzerland, as Days of Wonder learned the hard way on that one. The board was sub-par in quality when compared to other Ticket to Ride games, there were omissions (such as a lack of scoring table) and city misspellings, and the company eventually reissued the Destination Tickets that came with the game due to the lower quality paper they used. I'm looking forward to more details leaking out as we get closer to the release date of October 26!